Michadams had the most liked content! The auto gearbox is absolutely amazing ! By the past, I had an Evora S with the AT, but it was not really nice to use. The up shift was not fast at all, and down shift was even bad. You couldnt go down in first gear in hairpin bend (even if you could go down in first below 50km/h, in real situation, it was impossible to do). Now, it's quite as fast as every double clutch gearbox. I went on track with it, was really nice, the problem was I got a black flag due to the noise (106dB). The only complain with the AT is the lack of a LSD, but I can't feel it on main figures. Another great point for me, regarding the AT is the sound when you up shift, it's like a crackering noise, a big bang at every single change. You cant hear that with the manual ! The only "issue" you can't get the open/close exhaust button fitted like on the manual or previous Evoras. I assume is due to a different ECU mapping, but impossible at this moment. It's really annoying when you go on track, as you'll be black flagged on quite every track day. It came with the "classic" carbon diff. What is it for a front end, @Bibs ? Mine is on its way, just need some parts to finish it. If you dont go with the wider wheels, you dont have the rear arch extension I kept with the standard wheels as I wont go on track, the car will be more agile on usual roads, wet, most of the time. Ahaha ! I'm sure about the time. I lapped Spa in 3'03 in a FunCup with road tyres. 2'54 with an Evora NA (small wheels, Pirelli PZero, manual). 2'41 with a 211 GT4 manual / 048, in 2009 I didn't get back on track with a Lotus since 2012. 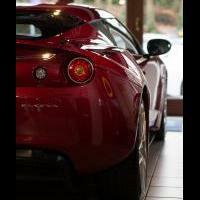 I made 2'48 with an Evora S MY12 IPS, Pirelli PZero Corsa. This was during the GT Days 2012, I was there for the belgian dealers (was working for Lotus at the moment). As I'm not a pro driver, was not alone in the car, IPS, I assume that a better driver, alone, could go under 2'46. If I didn't already order one, I would after your article, simply amazing write up ! Many thanx For sure, it will be super fast in Spa, a regular Evora S is capable of sub 2'46, which is already really fast regarding the HP/weight ratio.